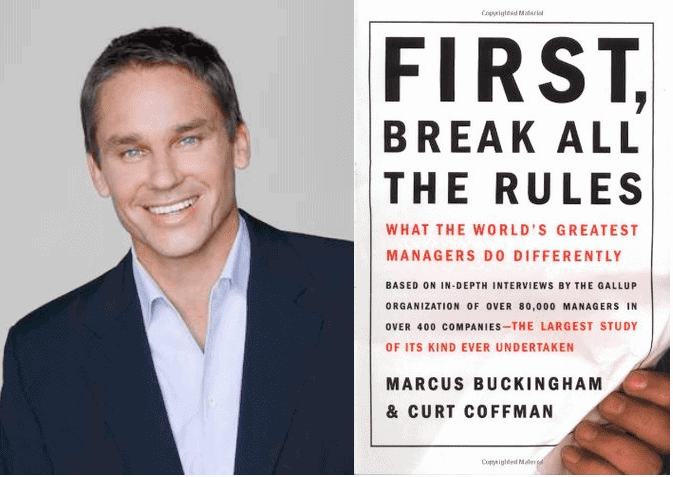 Lessons from Gallup's Marcus Buckingham in "First, Break all the Rules"
Marcus Buckingham has been working to help managers for decades. His research with Gallup is some of the most comprehensive in the world. The culmination of much of that research is in the book, “First, Break All the Rules.” It looks at dozens of Gallup’s best surveys and studies from over 1 million employees and 80,000 managers. 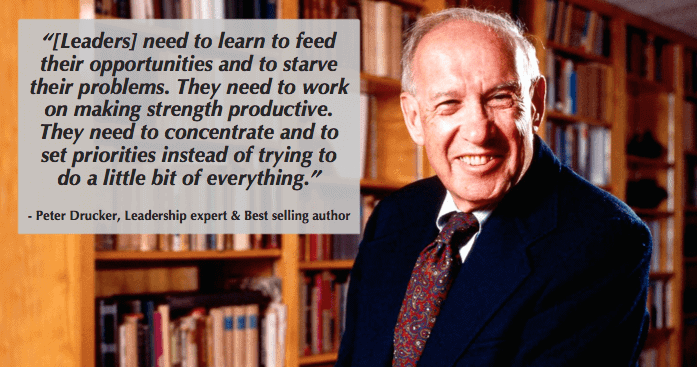 In his reviews of this research, Marcus Buckingham found that there were many unconventional lessons we can all learn from the best managers. So the question becomes: What separates a great manager from the rest? 1) Focus on the strengths of each person on your team. It can be easy to dwell on your people’s weaknesses. You must work hard to eliminate them, right? Instead, to get the best out of your people, focus on their strengths. Everyone wants to feel successful. And they want to do the work they love most. Think about the work in your job you enjoy. Are you good at it? Would others say it’s a strength of yours? Help your people thrive by giving them the same opportunity. Help them do more work in areas of strength. “The more experience you have, the more you realize that there is something seriously wrong with every employee in your company (including you). Literally, nobody is perfect. We all have weaknesses, and some of them affect our work. Some things we’re just better at doing or handling than others. So what’s a manager to do about the weaknesses of their team? Hire people with complimentary skills to cover each others’ weaknesses. Be thoughtful about the roles you put people in. Put everyone in the right role. Keep this in mind as you assign tasks, projects, and consider new opportunities for your team. Promote based on a match with their strengths. One of the reasons the Peter Principle hurts so many companies is that people are not set up for success when they’re promoted. If you don’t help someone understand what a new role requires, they’re unlikely to succeed. A key part of that is to look at how a person’s strengths align with the new role. Just because someone is great in their current role does not mean they’ll succeed in their next one. Also consider the importance of some of your good people staying in their current role. Excellence takes time, and can be hugely valuable to the company and them long term. Key to making good people want to stay in such roles is to help them feel they’re still growing. Work with your leadership to provide ways to advance without traditional promotion to management. Consider also how they can continue to be rewarded on this path (compensation, awards, etc), or they’ll be tempted to pursue better paying roles that don’t fit their strengths. Ever get bogged down trying to squeeze passable work out of a bad employee? How did it feel? If you’re like most managers, it’s frustrating work. It can consume tons of your time you could spend doing other things. Making matters worse, the results are often inconsistent. Fairness: It was the fairest thing to do. Your attention is a reward to your team. Learning: It was the best way to learn. You learn more from what’s working than the million ways to fail. Rewards: It’s the only way to stay focused on excellence. Are you trying to raise the bar or drag people up to it? Rather than try to be equal with time, attention, and management approaches, Gallup found the best managers treated everyone differently. Great managers know that leadership is not one size fits all. They work with each person uniquely: from their strengths, to talents, to how they care about their team members as individuals. “I am going to be very consistent with every one of you because I’ll treat every one of you differently. That’s the way it is. Humans crave attention. Who are you giving attention to? Don’t assume your people know how much you appreciate them. Don’t assume they know that you think they’re doing well or poorly. You have to tell them. How you spend your time signals a lot about what you value. If you value your best people you need to show it in your actions and words. Your top people have a ceiling that will amaze you. There’s is so much more to be gained in pushing them to new levels than fighting to get a little more out of your worst. In one example in “First, Break All the Rules,” they studied great employees in data entry roles. Initially, they found that top performers were 50% better than average. However, after investing in them, they were nearly 10X better than average. If you have ever heard the myth of the 10X engineer, then this concept should feel familiar. Do you really think someone can be a 10X engineer (or 10X anything else) without help? To get the best from your team, spend your time helping your best people become even greater. 3) Really care for everyone on your team. There are a variety of benefits to showing you care about your people including better engagement, and a stronger understanding of what motivates them. Find the root causes of problems to find better solutions. Great managers ask why and find the root cause of problems. The easy way out is to treat symptoms: Yell at them for being late, criticize unexpected poor work, or jump to conclusions. What you don’t know can make all the difference. Maybe they’re having trouble with child care, their living situation is a mess, or a family member is sick. You won’t know if you don’t ask. You’ll also make your people a lot more defensive and closed off if you jump straight to criticizing them. This is why when you try to turn around an underperformer we recommend starting with their side of the story. Don’t jump to conclusions with your team. Find out why. This attention paid off. Kukoc was the 2nd leading scorer on the Bulls in the 1994-1995 season, and in the next season, when Michael Jordan returned to the team, Kukoc happily returned to the bench and won the 6th man of the year award. Would Kukoc have done all that without a coach that cared about him, and understood him? Unlikely. 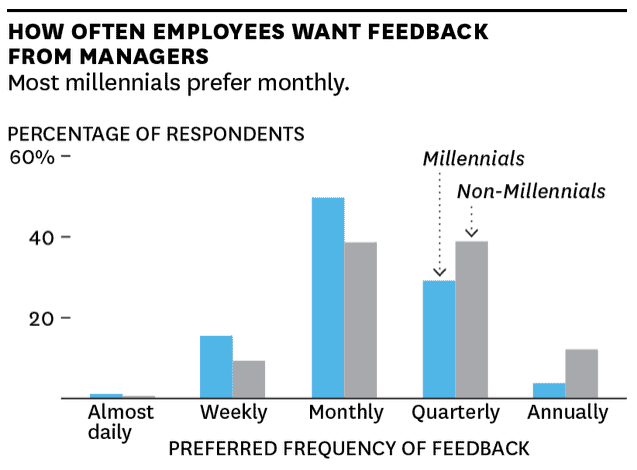 Give feedback privately and regularly. This is why one on one meetings can be so powerful, and are a key tool for great managers. As Marcus Buckingham writes, “You can introduce areas of poor performance little by little over time. And each time you raise the subject, you can refer to recent, vivid examples.” When you discuss issues over time, you’re much more likely to see progress and improvement. It’s 10 times better than the annual, high-level bombing. 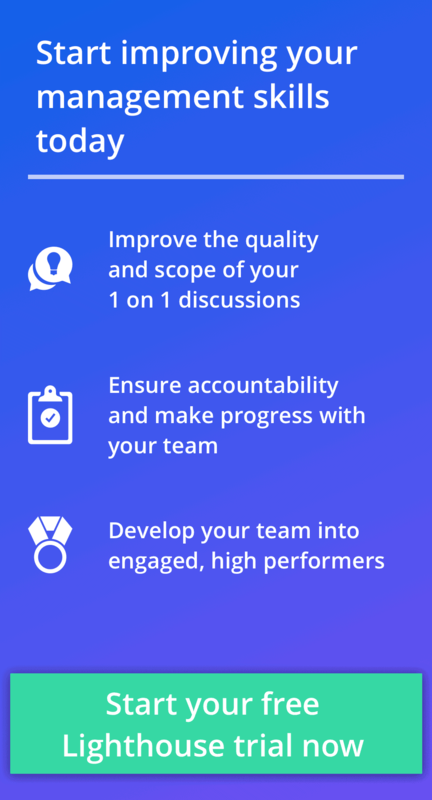 By using your one on one meetings for feedback, you ensure you have a regularly scheduled time to improve their performance. In addition, with regularly scheduled meetings, you can use it as a time for a variety of other beneficial actions like giving praise, and having growth & development conversations. Don’t waste them on status updates. These actions uncovered by Gallup and Marcus Buckingham are key to the success of great managers. While they’re not all that shocking, they do run counter to what all our instincts can push us to do. And if you want help learning, building, and maintaining these kinds of best practices and good habits, then sign up for a free trial of Lighthouse. 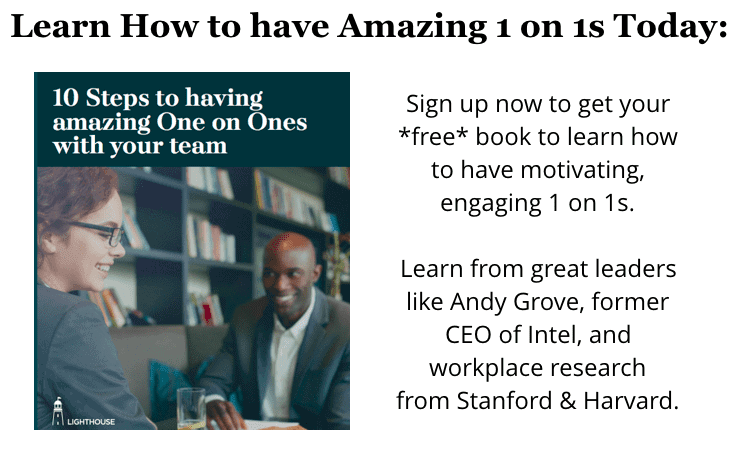 Built with lessons from Gallup, Deloitte, Google, Andy Grove, and many others, it can help you be great manager with a thriving team.